This is where responsive web design becomes so important: on the basis of the screen size of your user’s device, your website design automatically adjusts itself. However, what if there is one particular theme that you cannot live without? Worst of all, the said theme is not yet responsive. Now what? Furthermore, while responsive web design does ensure that your website looks presentable on mobile phones, it may or may not have the touch-friendly aspect associated with it. What next? If this is your case, have no fear! Allow me to introduce you to the WPtouch Pro plugin, developed by Brave New Code. 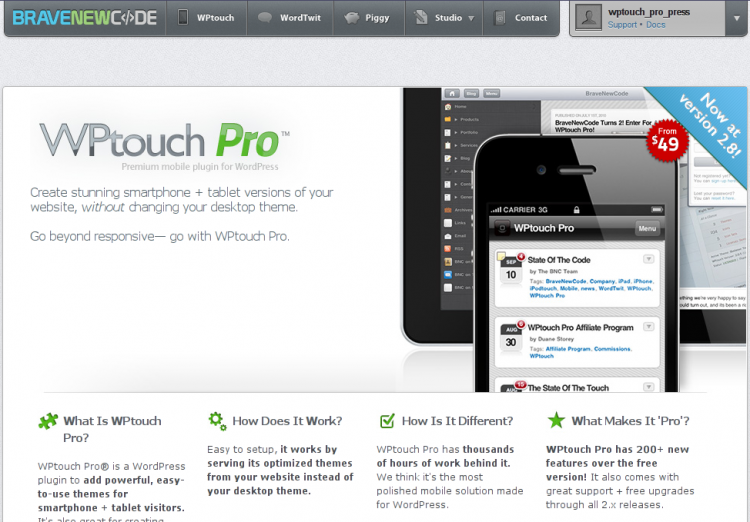 WPtouch Pro is a premium plugin for WordPress that lets you create smartphone and tablet versions of your website. Thus, while your current WordPress theme remains untouched for desktop screens, WPtouch Pro offers you the ability to tweak and create another version of your site, meant only for smartphones and tablets. WPtouch Pro comes with its own set of themes that you can configure to your heart’s content. First up, WPtouch Pro offers you style controls to help you configure the look and feel of your website: you can organize elements such as colors, fonts, logos and images as well as set the display options for categories, tags, author bio, etc. Still need more? You can create your own mobile themes, or upload child themes based on existing themes. Worried about custom menus on mobile devices? Nah! Don’t be worried: WPtouch Pro has got you covered there as well! Furthermore, WPtouch Pro comes with support for services such as AdSense and AdMob, and for any other ad service, you can drop in the custom code. The plugin also supports and intelligently scales videos, and if you have other plugins that do not perform well on mobile devices, but are essential for the desktop version, you can selectively disable them as well. Lastly, WPtouch Pro has support for custom post types as well. Nice! And How Much Do I Have to Pay? 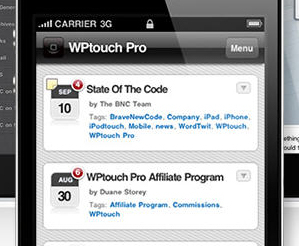 WPtouch Pro has a free version on offer, with limited functionality. It can serve as a previewing mechanism before you actually purchase the full version, but using the free version as a stand-alone unit for your website’s mobile audience may not be feasible — there is no documentation, no custom icons/menus/post types and so on. You can opt for a Pro Single license, which will set you back by $49. If you wish to use the plugin on multiple websites, you can go for Pro 5 Pack ($99 for five websites). Plus, if you require developer docs or PSDs, you can opt for Pro Developer for $199. Excluding the free version, all the others have also been localized in several languages, such as Spanish, German, French, Chinese, Japanese, etc. Alright, And How Does it Work? Once you install and activate the plugin, you can head directly to the Settings page to see what it has to offer. I installed it on a test site, and the Settings page greeted me with five tabbed sections, each with sub-sections of its own. First up, we have the self-explanatory General page. You can specify the regionalization and language settings, as well as tell WPtouch Pro to override WordPress default settings, such as landing page for mobile sites. Plus, you can also enable or disable push notifications (such as pingbacks or trackbacks) and configure the mobile advertising settings. There is also a backup and restore section on this page but the best part that I liked was the Compatibility section: you can disable WPtouch Pro on specific pages or URLs of your blog. The next page, Theme Browser, allows you to select themes. Apart from the default theme, there is also a Skeleton template which you can use as a framework to develop your own themes. Now, my guess is that the Skeleton template will be employed only by designers or developers for client-work, and most other end users will be sticking with the Classic template (or, at the most, clone the Classic theme and/or create a child). However, the Classic theme looks decent enough, and offers ample functionality to serve anyone’s purpose. 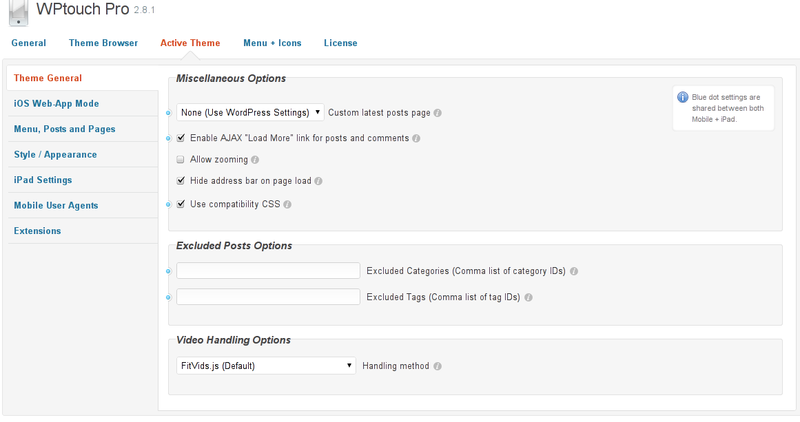 The third page, Active Theme, is comparable to your Theme Options page under WP’s Appearance menu. You can set up theme options, configure theme appearance, styling, header, menus, custom post types as well as settings for iPad users. All well, looks good, and yes, it is pretty functional. However, I cannot resist my urge to rant here: I am an Android user. All I can see is iThis and iThat on this page. The fourth page, Menu + Icons, deals with, well, menus and icons! You are provided with multiple icon sets — they look decent, and will serve most users quite well. However, do not expect them to be outright gorgeous! Of course, you can upload your own set of icons. You can also have up to three custom menus in the header. The fifth page is all about Licensing and Activation. I tried visiting my test site using my smartphone. Trust me, it looks good. Best part of all, the Classic theme offers a right tone of minimalism. I also attempted to check it out using Firefox Alpha OS on a simulator device — apparently, the WPtouch Pro optimized version was too slow here (the normal responsive version works fine, though). However, I will not blame WPtouch Pro for this: Firefox mobile OS is still far from BETA, and expecting the plugin to offer compatibility with that would be overkill. 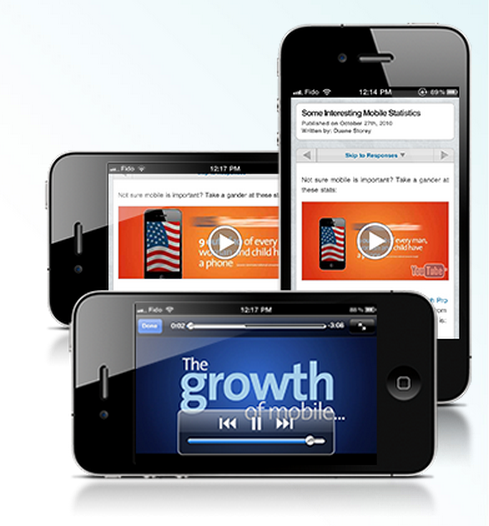 Also, WPtouch Pro attempts to divide the mobile world in two segments: iPad and smartphones. There is not much to cater to the occasional special needs of Android tablets — this should not pose a problem for most users though, because Android and other smartphone OSs are rarely as sentimental as iOS. That said, it will be an added advantage if more readymade themes are offered, because as far as my guess goes, many end users may not have the expertise to code child themes and if everyone of them goes on to rely on the Classic theme for WPtouch Pro, it may become too common in terms of appearance. Lastly, I do find the icon sets feature to be overdone: having a leopard, dice, martini and tetris icon will not help many users, after all! As far as I can comment, I feel WPtouch Pro is not something you’d like to employ for your tumblog — a responsive theme might do just fine. However, for an online magazine or professional blog, having WPtouch Pro can be a good advantage. It lets you customize almost any aspect of your website’s mobile version, and a properly customized mobile website can go a long way in converting random visitors into loyal subscribers. Sufyan bin Uzayr is a freelance writer and Linux programmer based in India. He writes for several print magazines as well as technology blogs, and has also authored a book named Sufism: A Brief History. His primary areas of interest include open source, mobile development, web CMS and vector art. Sufyan is also the Editor of an e-journal named Brave New World. Would feel better about WP Touch if they were more upfront about the free version not supporting tablets. My client discovered this liability. I am happy to pay for good software. I am not happy to get caught by trialware when the limitations are not well documented. 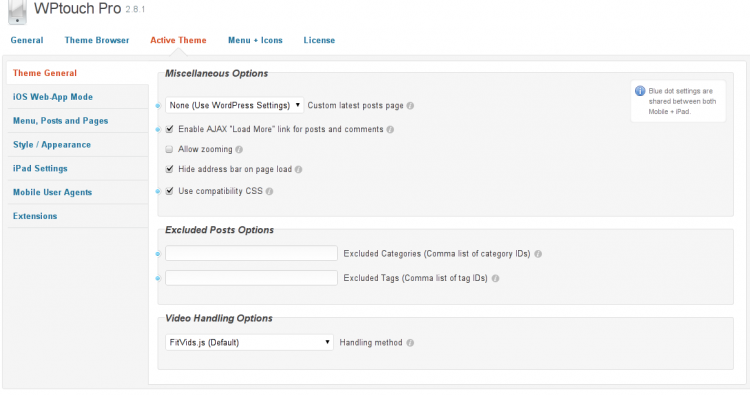 Next Entry: Is the WordPress GPL Being Abused?